Now that we have finished learning fractions, we proceed to the learning about decimals. A decimal is another representation of numbers. For instance, the fraction can be represented with 0.5 and the decimal can be represented with 3.2. In this post, we are going to learn about addition of decimals. In learning decimals, there is just one simple rules: write the numbers, one under the other such that the decimal points are aligned. 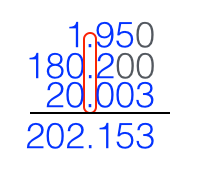 In adding 3.02 and 80.401, the decimal part of the 80.401 has more digits that that of 3.02. But there is no number to the right of 2, so we can just put 0. Remember that adding 0 to the right hand size of the last number in the decimal does not change its value. That is, 0.02, 0.020, 0.0200, 0.02000 are just the same, so we did not change its value. Well, I think you can do this on your own. The answer is 11.601. Of course, in the actual Civil Service Exam where time is essential, you do not really to put all the 0’s as I have done above. You can just align the decimal points and add the corresponding columns. In case there is just one number in one column, just copy the number on the sum.